JBNSTS Result 2018 for Jagdish Bose National Science Talent Search (JBNSTS) has been declared for the Senior Talent Search (STS) Phase-1. The students who have been placed in the JBNSTS Senior Merit List have to appear in the interview. JBNSTS Final Result 2018 is expected to be declared in the month of November 2018 for the talent search exam which was conducted on 19 August 2018. The scholarship is one of the prestigious scholarships in India which is awarded in the field of Science, Engineering, and medicine. JBNSTS Scholarship is provided on the basis of the Talent Search Examination. The candidates will be selected on the basis of their overall performance in their JBNSTS written examination i.e. Junior Talent Search Test (JTST) and Senior Talent Search Test (STST). JBNSTS Scholarship Amount: The selected candidates in JTST will get the scholarship amount of Rs. 1000 per month for two years and also they will be awarded an annual book grant of Rs. 2500 for 2 years. While the qualified candidates in STS will be awarded by the monthly scholarship amount of Rs. 3000 plus Rs. 2000 (yearly book grant). 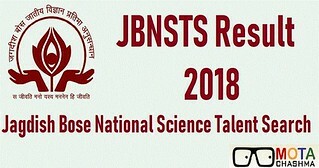 The JBNSTS Result 2018 for Junior Talent Search Test as well as Senior Talent Search Test will be provided on this page. The aspirants can get complete information related to JBNSTS Result 2018 and other related information from this page. Latest Update: JBNSTS Result 2018 for Senior Talent Search (1st Phase) has been declared. The link is available on this page below. Candidates can check the important dates related to JBNSTS Result 2018. JBNSTS Result will be declared after the successful commencement of the JBNSTS Written Test, Interview, and Scientific Creativity Test. The JBNSTS Result is likely to be declared in November 2018. The link to check the JBNSTS Result will be provided on this page. The candidates will have to enter their registration number in the space provided in order to download & print their JBNSTS Scholarship Offer Letter. Step 1: The candidates will have to click on the given link or visit the official website. Step 2: Then, click on the link to view JBNST Result for Junior Talent Search Test or Senior Talent Search Test. Step 3: The list of selected candidates will appear on the screen. Step 4: The candidates will also be required to enter their registration number to download and print JBNSTS Scholarship Offer Letter. Step 5: Now, candidates can take the printout of their JBNSTS Result 2018. JBNSTS STS Result has been declared and 311 candidates have been shortlisted for the interview. The candidate has to enter their registration number in the given link to download the JBNSTS Interview Call letter. (Near Ruby Hospital, adjacent to Bharat Petroleum Pump on Rashbehari Connector). JBNSTS, Jagdish Bose National Science Talent Search, Kolkata is an autonomous registered body that provides Scholarship to the students of West Bengal who are studying in the field of Science. This scholarship program aims to conserve the scientific talent of the country by helping them in monetary ways. It also helps in providing them exposure to different seminars, guidance, colloquia, and placement programs etc. Inery related to JBNSTS Result 2018, you can write us in the comment section below.